This one is for all the mistfits out there, or anyone who loves one. I qualify two ways there, so I'm smitten, and it's not a modest thing. Just your normal 5-year-old girl, really. Loves Pokemons, Nintendo, and is a confirmed Chocodile addict. She loves manga and when she finally goes to school, is bewildered at the lack of magical girls there. She's apprehensive about the world around her, but takes it on because, when you're five years old, what else are you going to do? She's got a mother and a father from different worlds (Dad's a vampire, Mom's a giant snake), and she finds herself in an incidental family somewhere in a place that vaguely resembles southeast Portland. She's also a medusa. Which explains the snakey hair. The strip, eponymously named Modest Medusa, has been running for four years now, debuting in January 2011. It traces the perambulations (if a little girl with a snake-body can be said to have such things) of a 5-year-old medusa girl who stumbles from her world into ours, rooked over here by a pair of mean-girl mermaids, and enters the world of her accidental father figure - a comic version of the artist, Portlander Jake Richmond - through his toilet. His apartment waterlogged, he moves to another room, and as Modest stays, a completely different life. It has to be seen to be believed. In the four short years of the comic's life, it has swung between adventures heroic, fantastic and fatal and dryly humorous and banal but always with the viewpoint of a little kid just trying to figure out where she's going to fit in. Just like other little kids, her arrival causes tragic disruption (though in ways at times quite hazardous for her new friends). Where Modest Medusa really shines out, though, is in a subtheme that's quite unexpected … and that takes the form of the reaction of the world around her. 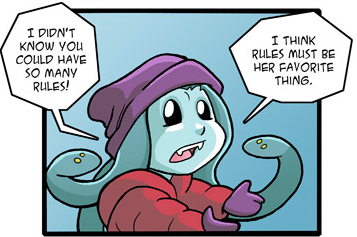 Here, the comic operates on an evolved level, because while other characters in the world do see that she is, in fact, a snake girl with snakes for hair, they seem to be little bothered by it. Like the characters in the Pooh stories who accepted Eeyore for what he was and loved him without trying to change him, adults and kids regard her as a little girl - and with her particular talent for winning friends, she soon finds some sort of place. Jake Richmond has made her a kind of a totem for those us who just don't feel like we belong exactly anywhere but won't let that stop us. She's a fully realized character who finds herself in a world she didn't make. I don't know about anybody else, but that speaks to me. In Modest's world, the gaze of a medusa won't turn you to stone, but she might melt your heart just a little. GET IT: The comic is available in toto for you to read at ModestMedusa.com, (Facebook for Jake Richmond so you can be updated every MWF) and can be found in bound, very well-done book format at The Sprightly Bean comic cafe (Facebook). Jake Richmond is also part of Patreon, the website that allows people to actively support comic artists by becoming regular patrons of the artist.